This article is about the historical and future expansion of NATO. 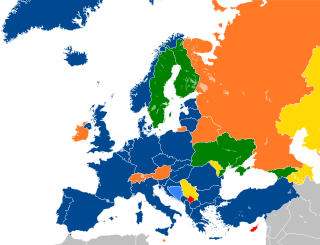 For the composition of NATO, see Member states of NATO. After its formation in 1949 with twelve founding members, NATO grew by including Greece and Turkey in 1952 and West Germany in 1955, and then later Spain in 1982. After the Cold War ended, and Germany reunited in 1990, there was a debate in NATO about continued expansion eastward. In 1999, Poland, Hungary, and the Czech Republic joined the organization, amid much debate within the organization and Russian opposition. Another expansion came with the accession of seven Central and Eastern European countries: Bulgaria, Estonia, Latvia, Lithuania, Romania, Slovakia, and Slovenia. These nations were first invited to start talks of membership during the 2002 Prague summit, and joined NATO shortly before the 2004 Istanbul summit. Albania and Croatia joined on 1 April 2009, prior to the 2009 Strasbourg–Kehl summit. The most recent member state to be added to NATO is Montenegro on 5 June 2017. As of 2019, NATO officially recognizes four aspiring members: Bosnia and Herzegovina, Georgia, North Macedonia and Ukraine. North Macedonia signed an accession protocol to become a NATO member state in February 2019, which is undergoing ratification by the member states. Future expansion is currently a topic of debate in several countries outside the alliance, and countries like Sweden, Finland, and Serbia have open political debate on the topic of membership, while in countries like Ukraine, support and opposition to membership is tied to ethnic and nationalist ideologies. The incorporation of countries formerly part of the Eastern Bloc and the Soviet Union has been a cause of increased tension between NATO countries and Russia. Negotiations in London and Paris in 1954 ended the allied occupation of West Germany and allowed for its rearmament as a NATO member. NATO has added new members seven times since its founding in 1949 to include twenty-nine members. Twelve countries were part of the founding of NATO: Belgium, Canada, Denmark, France, Iceland, Italy, Luxembourg, the Netherlands, Norway, Portugal, the United Kingdom, and the United States. The early years of the Cold War saw a stark divide between Capitalist states, backed by United States, and Communist satellite states of the Soviet Union. This divide eased inclusion of Portugal under Salazar in NATO and encouraged the anti-Communist governments of Greece and Turkey to join NATO in 1952. Greece would suspend its membership in 1974, over the Turkish invasion of Cyprus, but rejoined in 1980 with Turkey's cooperation. 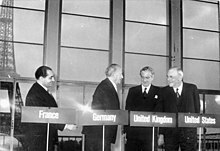 The Bonn–Paris conventions ended the allies’ occupation of West Germany, and were ratified in part on the condition that West Germany join NATO, which it did in 1955. Though initially isolationist, Spain under Francisco Franco was staunchly anti-Communist, and bound by regular defence agreements with NATO countries. After its transition to democracy, Spain came under pressure to normalize its European relations, including joining NATO, which it did in 1982. A referendum in 1986 confirmed popular support for this. The first post-Cold War expansion of NATO came with German reunification on 3 October 1990, when the former East Germany became part of the Federal Republic of Germany and the alliance. This had been agreed in the Two Plus Four Treaty earlier in the year. To secure Soviet approval of a united Germany remaining in NATO, it was agreed that foreign troops and nuclear weapons would not be stationed in the former East Germany, and the topic of further NATO expansion east was raised. There is no mention of NATO enlargement in the September–October 1990 agreements on German reunification, so there was no formal commitment not to expand. Whether or not the West informally committed to not enlarge NATO to the East is a matter of dispute among historians and international relations scholars. Harvard University historian Mark Kramer rejects that an informal agreement existed, whereas Texas A&M University political scientist Joshua R. Itzkowitz Shifrinson argues that an informal agreement existed. In December 2017, Svetlana Savranskaya and Tom Blanton of the National Security Archive at George Washington University argued that newly declassified documents showed that an informal agreement existed. Jack Matlock, US ambassador to the Soviet Union during its final years, said that the West gave a "clear commitment" not to expand, and declassified documents indicate that Soviet negotiators were given the oral impression by diplomats like Hans-Dietrich Genscher and James Baker that NATO membership was off the table for countries such as Czechoslovakia, Hungary, or Poland. In 1996, Gorbachev wrote in his Memoirs, that "during the negotiations on the unification of Germany they gave assurances that NATO would not extend its zone of operation to the east," and repeated this view in an interview in 2008. However, in 2014, Gorbachev said "The topic of 'NATO expansion' was not discussed at all [in 1990], and it wasn't brought up in those years. I say this with full responsibility. Western leaders didn't bring it up, either." Eduard Shevardnadze, foreign minister of the Soviet Union between 1985 and 1991, has always maintained that "NATO's expansion beyond German borders never came up for negotiation." According to Robert Zoellick, a State Department official involved in the Two Plus Four negotiating process, no formal commitment regarding enlargement was made. NATO added the Czech Republic, Hungary, and Poland at the 1999 Washington summit, and established the protocol for Membership Action Plans. In February 1991, Poland, Hungary, and the Czech Republic and Slovakia (as Czechoslovakia) formed the Visegrád Group to push for European integration under the European Union and NATO, as well as to conduct military reforms in line with NATO standards. Internal NATO reaction to these former Warsaw Pact countries was initially negative, but by the 1991 Rome summit in November, members agreed to a series of goals that could lead to accession, such as market and democratic liberalization, and that NATO should be a partner in these efforts. In subsequent years, wider forums for regional cooperation between NATO and its eastern neighbors were set up, including the North Atlantic Cooperation Council (later the Euro-Atlantic Partnership Council) and the Partnership for Peace. While the other Visegrád members were invited to join NATO at its 1997 Madrid summit, Slovakia was excluded based on what several members considered undemocratic actions by nationalist Prime Minister Vladimír Mečiar. Romania and Slovenia were both considered for invitation in 1997, and each had the backing of a prominent NATO member, France and Italy respectively, but support for enlargement was not unanimous, particularly in the US Congress. In an open letter to US President Bill Clinton, more than forty foreign policy experts including Bill Bradley, Sam Nunn, Gary Hart, Paul Nitze, and Robert McNamara expressed their concerns about NATO expansion as both expensive and unnecessary given the lack of an external threat from Russia at that time. A 2006 study in the journal Security Studies argued that the NATO enlargements in 1999 and 2004 contributed to democratic consolidation in Central and Eastern Europe. Domestic politics in Eastern European countries continued to push for more enlargement, and political parties reluctant to move on NATO membership, such as the Bulgarian Socialist Party and Slovak HZDS, were voted out of office. Hungary's interest in joining was confirmed by a November 1997 referendum that returned 85.3 percent in favor of membership. Russia's actions in the First Chechen War were also a motivating factor for several countries that had memories of similar Soviet offensives. At the 1999 Washington summit, where Hungary, Poland, and the Czech Republic officially joined, NATO also issued new guidelines for membership with individualized "Membership Action Plans" for Albania, Bulgaria, Estonia, Latvia, Lithuania, North Macedonia, Romania, Slovakia, and Slovenia. In May 2000, these countries joined with Croatia to form the Vilnius Group in order to cooperate and lobby for common NATO membership, and by the 2002 Prague summit seven were invited for membership, which took place at the 2004 Istanbul summit. Russia was particularly upset with the addition of the three Baltic states, the first countries that were part of the Soviet Union to join NATO. Croatia also started a Membership Action Plan at the 2002 summit, leading to a national debate on whether a referendum on NATO membership needed to be held there. Croatian Prime Minister Ivo Sanader ultimately agreed in January 2008, as part of forming a coalition government with the HSS and HSLS parties, not to officially propose one. Montenegro declared independence on 3 June 2006, and the new country subsequently joined the Partnership for Peace programme at the 2006 Riga summit. Albania and Croatia were invited to join NATO at the 2008 Bucharest summit that April, though Slovenia threatened to hold up Croatian membership over their border dispute in the Bay of Piran. Slovenia did ratify Croatia's accession protocol in February 2009, and Croatia and Albania both officially joined NATO just prior to the 2009 Strasbourg–Kehl summit, with little opposition from Russia. Montenegro applied for a Membership Action Plan on 5 November 2008, which was granted in December 2009. Montenegro also began full membership with the Adriatic Charter of NATO aspirants in May 2009. On December 2, 2015, NATO formally invited Montenegro to join the alliance, with negotiations concluding in May 2016. Montenegro formally joined NATO on 5 June 2017. The Parties may by unanimous agreement, invite any other European State in a position to further the principles of this Treaty and to contribute to the security of the North Atlantic area to accede to this Treaty. Any State so invited may become a Party to the Treaty by depositing its instrument of accession with the Government of the United States of America. The Government of the United States of America will inform each of the Parties of the deposit of each such instrument of accession. This article poses two general limits to non-member states. First, only European states are eligible for new membership, and second, these states not only need the approval of all the existing member states, but every member state can put some criteria forward that have to be attained. In practice, NATO formulates a common set of criteria, but for instance Greece blocked the Republic of Macedonia's accession to NATO for many years due to the disagreement over the use of the name Macedonia. Turkey similarly opposes the participation of the Republic of Cyprus with NATO institutions as long as the Cyprus dispute is not resolved. Since the 1991 Rome summit, when the delegations of its member states officially offered cooperation with Europe's newly democratic states, NATO has addressed and further defined the expectations and procedure for adding new members. The 1994 Brussels Declaration reaffirmed the principles in Article 10 and led to the "Study on NATO Enlargement". Published in September 1995, the study outlined the "how and why" of possible enlargement in Europe, highlighting three principles from the 1949 treaty for members to have: "democracy, individual liberty, and rule of law". As NATO Secretary General Willy Claes noted, the 1995 study did not specify the "who or when," though it discussed how the then newly formed Partnership for Peace and North Atlantic Cooperation Council could assist in the enlargement process, and noted that on-going territorial disputes could be an issue for whether a country was invited. At the 1997 Madrid summit, the heads of state of NATO issued the "Madrid Declaration on Euro-Atlantic Security and Cooperation" which invited three Eastern European countries to join the alliance, out of the twelve that had at that point requested to join, laying out a path for others to follow. NATO provides feedback as well as technical advice to each country and evaluates its progress on an individual basis. Once a country is agreed to meet the requirements, NATO can issue that country an invitation to begin accession talks. Currently, two countries have a Membership Action Plan: Bosnia and Herzegovina and North Macedonia. [needs update] Former MAP participants were Albania and Croatia between May 2002 and April 2009, and Montenegro between December 2009 and June 2017, when they joined NATO. The final accession process, once invited, involves five steps leading up to the signing of the accession protocols and the acceptance and ratification of those protocols by the governments of the current NATO members. Intensified Dialogue was first introduced in April 2005 at an informal meeting of foreign ministers in Vilnius, Lithuania, as a response to Ukrainian aspirations for NATO membership and related reforms taking place under President Viktor Yushchenko, and which followed the 2002 signing of the NATO–Ukraine Action Plan under his predecessor, Leonid Kuchma. 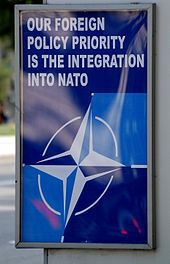 This formula, which includes discussion of a "full range of political, military, financial and security issues relating to possible NATO membership" had its roots in the 1997 Madrid summit, where the participants had agreed "to continue the Alliance's intensified dialogues with those nations that aspire to NATO membership or that otherwise with to pursue a dialogue with NATO on membership questions". In September 2006, Georgia became the second to be offered the Intensified Dialogue status, following a rapid change in foreign policy under President Mikhail Saakashvili, and what they perceived as a demonstration of military readiness during the 2006 Kodori crisis. Montenegro, Bosnia and Herzegovina, and Serbia similarly received offers at the April 2008 Bucharest summit. While their neighbors both requested and accepted the dialogue programme, Serbia's offer was presented to guarantee the possibility of future ties with the alliance. North Macedonia signed an accession protocol to NATO on 6 February 2019. Bosnia and Herzegovina is the only other country with a Membership Action Plan, which together with Georgia, were named NATO "aspirant countries" at the North Atlantic Council meeting on 7 December 2011. Ukraine was recognized as an aspirant country after the 2014 Ukrainian revolution. ^ Originally invited to join the MAP in April 2010 under the condition that no Annual National Programme would be launched until one of the conditions for the OHR closure – the transfer of control of immovable defence property to the central Bosnian authorities from the two regional political entities – was fulfilled. Condition waived in 2018. ^ NATO–Ukraine Action Plan adopted on 22 November 2002. NATO-led Romanian IFOR peacekeepers patrolled Bosnia and Herzegovina under Operation Joint Endeavour. The 1995 NATO bombing of Bosnia and Herzegovina targeted the Bosnian Serb Army and together with international pressure led to the resolution of the Bosnian War and the signing of the Dayton Agreement in 1995. Since then, NATO has led the Implementation Force and Stabilization Force, and other peacekeeping efforts in the country. Bosnia and Herzegovina joined the Partnership for Peace in 2006, and signed an agreement on security cooperation in March 2007. Bosnia and Herzegovina began further cooperation with NATO within their Individual Partnership Action Plan in January 2008. The country then started the process of Intensified Dialogue at the 2008 Bucharest summit. The country was invited to join the Adriatic Charter of NATO aspirants in September 2008. The Federation of Bosnia and Herzegovina within Bosnia and Herzegovina has expressed willingness to join NATO, however, it faces consistent political pressure from Republika Srpska, the other political entity in the country, alongside its partners in Russia. On 2 October 2009, Haris Silajdžić, the Bosniak Member of the Presidency, announced official application for Membership Action Plan. On 22 April 2010, NATO agreed to launch the Membership Action Plan for Bosnia and Herzegovina, but with certain conditions attached. Turkey is thought to be the biggest supporter of Bosnian membership, and heavily influenced the decision. The conditions of the MAP, however, stipulated that no Annual National Programme could be launched until 63 military facilities are transferred from Bosnia's political divisions to the central government, which is one of the conditions for the OHR closure. The leadership of the Republika Srpska has opposed this transfer as a loss of autonomy. All movable property, including all weapons and other army equipment, is fully registered as the property of the country starting 1 January 2006. A ruling of the Constitutional Court of Bosnia and Herzegovina on 6 August 2017 decided that a disputed military facility in Han Pijesak is to be registered as property of Bosnia and Herzegovina. It is expected to be a precedent for all other similar facilities, and could thus be the final factor that will enable the activation of the MAP for Bosnia. Despite that all immovable property is not fully registered, NATO approved the activation of the Membership Action Plan for Bosnia and Herzegovina, and called on Bosnia to submit an Annual National Program on 5 December 2018. An August 2010 poll showed that 70 percent of the country supports NATO membership, but results were very different in the two constituent entities. While 90 percent of the Federation of Bosnia and Herzegovina supported NATO membership, only 33 percent in Republika Srpska did. Bosnia's chances of joining NATO may depend on Serbia's attitude towards the alliance, since the leadership of Republika Srpska might be reluctant to go against Serbian interests. In October 2017, the National Assembly of the Republika Srpska passed a nonbinding resolution opposing NATO membership for Bosnia and Herzegovina. Georgia moved quickly following the Rose Revolution in 2003 to seek closer ties with NATO. Georgia's northern neighbor, Russia, opposed the closer ties, including those expressed at the 2008 Bucharest summit where NATO members promised that Georgia would eventually join the organization. Complications in the relationship between NATO and Georgia includes the presence of Russian military forces in internationally recognized Georgian territory as a result of multiple recent conflicts, like the 2008 Russo-Georgian War over the territories of Abkhazia and South Ossetia, both of which are home to a large number of citizens of the Russian Federation. On 21 November 2011, Russian President Dmitry Medvedev while addressing soldiers in Vladikavkaz near the Georgian border stated that Russia's 2008 invasion had prevented any further NATO enlargement into the former Soviet sphere. A nonbinding referendum in 2008 resulted in 72.5 percent of voters supporting NATO accession. In May 2013, Georgian Prime Minister Bidzina Ivanishvili stated that his goal was to get a Membership Action Plan (MAP) for his country from NATO in 2014. In June 2014, diplomats from NATO suggested that while a MAP was unlikely, a package of "reinforced cooperation" agreements was a possible compromise. Anders Fogh Rasmussen confirmed that this could include the building of military capabilities and armed forces training. Macedonian troops have participated with NATO security missions including ISAF in Afghanistan and KFOR in Kosovo. The country joined the Partnership for Peace in 1995, and commenced its Membership Action Plan in 1999, at the same time as Albania. Participating in the 1999 NATO intervention in Kosovo, it received aid from NATO in dealing with refugees fleeing from Kosovo. In August 2001, NATO intervened in the 2001 insurgency, during which a rebel Albanian group, the National Liberation Army, fought government forces. In Operation Essential Harvest, NATO troops joined with the Macedonian military to disarm rebel forces following a cease-fire agreement. At the 2008 Bucharest summit, Greece blocked a proposed invitation because it believed that its neighbor's constitutional name implies territorial aspirations toward its own region of Greek Macedonia. NATO nations agreed that the country would receive an invitation upon resolution of the Macedonia naming dispute. Macedonia sued Greece at the International Court of Justice (ICJ) over their veto of Macedonia's NATO membership. The ICJ ruled in December 2011 that Greece was wrong to have blocked its neighbor's bid, finding them in breach of a 1995 interim accord that allowed Macedonia to join international organizations under the name "the Former Yugoslav Republic of Macedonia", which is how NATO, with the exception of Turkey, recognized their bid. Greece also blocked Macedonia's accession to the European Union over the naming dispute. Macedonia was part of the Vilnius Group, and had formed the Adriatic Charter with Croatia and Albania in 2003 to better coordinate NATO accession. In March 2016, Macedonian Defense Minister Zoran Jolevski stated his hope that his country's handling of the European migrant crisis might bring it closer to NATO membership. A poll following the 2008 summit showed that 82.5 percent of citizens surveyed opposed changing the constitutional name in order to join NATO. Elections were called following the 2008 summit, resulting in further support for the centre-right pro-NATO party, VMRO-DPMNE. The elections were marred by violence that was criticized by NATO members. Ethnic tensions have persisted in North Macedonia, and NATO has called for dialogue following clashes such as those in the city of Kumanovo in 2015, which were blamed in part on the delay in NATO and European integration. NATO membership in general is supported by 81 percent according to a November 2014 poll. On 12 June 2017, Prime Minister Zoran Zaev signaled he would consider alternatives names for the country in order to strike a compromise with Greece, settle the naming dispute, and lift Greek objections to North Macedonia joining the alliance. Zaev also floated the idea of Macedonia joining the alliance under the provisional name it used at the United Nations. After the Prespa Agreement was reached in June 2018, NATO invited North Macedonia to begin membership talks on 11 July 2018, saying the country could join the organization once the naming issue was resolved. Formal accession talks began on 18 October 2018 and NATO's members signed North Macedonia's accession protocol on 6 February 2019. As president, Viktor Yanukovych pursued closer relations with Russia. Ukraine's present and future relationship with NATO has been politically divisive, and is part of a larger debate between Ukraine's political and cultural ties to both the European Union and Russia. It established ties to the alliance with a NATO–Ukraine Action Plan on 22 November 2002, and joined NATO's Partnership for Peace initiative in February 2005. Then in April 2005, Ukraine entered into the Intensified Dialogue programme with NATO. In March 2008, under Ukrainian President Viktor Yushchenko and Prime Minister Yulia Tymoshenko, Ukraine sent an official letter of application for a Membership Action Plan (MAP), the first step in joining NATO. These leaders however guaranteed their opposition that membership in any military alliance would not pass without public approval in a referendum. This idea had gained support from a number of NATO leaders, particularly those in Central and Eastern Europe. Russian leaders like Prime Minister and President-Elect Dmitry Medvedev made clear their opposition to Ukraine membership, and leading up to the April 2008 Bucharest summit their emissary actively lobbied against a Ukrainian MAP. After some debate among members at the summit, NATO Secretary General Jaap de Hoop Scheffer declared in a press conference that Ukraine, together with Georgia, would someday join NATO, but neither would begin Membership Action Plans. At this summit, Russian President Vladimir Putin, in his last international speech before switching jobs with Medvedev, listed his grievances with NATO, and called Ukrainian membership "a direct threat" to his country. The Euromaidan protests that led to Viktor Yanukovych fleeing the presidency attracted support from Western politicians. The 2010 election returned Viktor Yanukovych to the presidency and marked a turnaround in Ukraine's relations with NATO. In February 2010, he stated that Ukraine's relations with NATO were currently "well-defined", and that there was "no question of Ukraine joining NATO". He said the issue of Ukrainian membership of NATO might "emerge at some point, but we will not see it in the immediate future". While visiting Brussels in March 2010, he further stated that there would be no change to Ukraine's status as a member of the alliance's outreach programme. He later reiterated during a trip to Moscow that Ukraine would remain a "European, non-aligned state". Then, on 3 June 2010 the Ukrainian parliament voted to exclude the goal of "integration into Euro-Atlantic security and NATO membership" from the country's national security strategy in a bill drafted by Yanukovych himself. The bill forbade Ukraine's membership in any military bloc, but allowed for co-operation with alliances such as NATO. 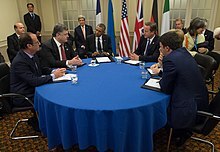 Petro Poroshenko was elected as President of Ukraine in 2014, and met with NATO leaders prior to the Wales summit about relations with the alliance. Following months of Euromaidan street protests that began because of his refusal to sign an Association Agreement with the European Union in favor of deals from Russia, President Yanukovych fled Kyiv in February 2014, ultimately to Russia, and parliament voted to remove him from his post. This brought another change in direction of Ukraine's association with Europe and by extension NATO. In 2014, pro-Russian unrest occurred in eastern Ukraine and Crimea was annexed by the Russian Federation in March. As part of an effort to assuage concerned groups, newly installed Prime Minister Arseniy Yatsenyuk addressed the topic in a speech on 18 March 2014, emphasizing that Ukraine was not seeking NATO membership. US President Barack Obama echoed this position the following week, while calling for greater NATO presence in Eastern Europe. However, in response to the Russian military intervention in Ukraine, Yatsenyuk announced his intentions to resume the bid for NATO integration on 29 August 2014, and in December 2014, Ukraine's parliament voted to drop the non-aligned status that it adopted in 2010. NATO Secretary General Anders Fogh Rasmussen has stated that NATO membership is still an option for Ukraine, and support for NATO membership has risen to 63.9 percent in government-controlled Ukraine according to a July 2015 poll. Previous polls had shown that the decline in opposition to membership was linked to the ongoing Russian intervention. On 8 June 2017, Ukraine's Verkhovna Rada passed a law making integration with NATO a foreign policy priority. In July 2017 Poroshenko announced that he would seek the opening of negotiations on a Membership Action Plan with NATO. By March 2018, NATO had recognized Ukraine as an aspirant country. On September 20, 2018, the Ukrainian parliament approved amendments to the constitution that would make the accession of the country to NATO and the EU a central goal and the main foreign policy objective. The border between Finland and Russia is about 1,340 km (833 mi) long. Finland participates in nearly all sub-areas of the Partnership for Peace programme, and has provided peacekeeping forces to both the Afghanistan and Kosovo missions. The possibility of Finland's membership in NATO was one of the most important issues debated in relation to the Finnish presidential election of 2006, and continues to be a significant issue in Finnish politics. In 2007, Finland made various technical preparations for membership, with the then Defence Minister Jyri Häkämies eager to pursue NATO membership. Nevertheless, public interest in the issue has since decreased. In April 2014, the government announced that they would sign a "Memorandum of Understanding" with NATO on Finland's readiness to receive military assistance and to aid NATO in equipment maintenance. However, Defence Minister Carl Haglund emphasized that this memorandum would not be a step towards membership. Out of the major Finnish political parties, the National Coalition Party and Swedish People's Party of Finland support NATO membership. In 2016, the party conference of the National Coalition Party agreed that Finland should apply for membership in the "following years". In the vision of the Swedish People's Party of Finland, Finland will be a NATO member in 2025. Many individual politicians have advocated for NATO as well, including the current President Sauli Niinistö and former Prime Minister Alexander Stubb, as well as former President Martti Ahtisaari, who has argued that Finland should join all the organizations supported by other Western democracies in order "to shrug off once and for all the burden of Finlandization." Two other former presidents from the Social Democratic Party, Tarja Halonen and Mauno Koivisto, have publicly opposed the idea, arguing that NATO membership would deteriorate Finland's relations with Russia. Finland has received some very critical feedback from Russia for even considering the possibility of joining NATO, with a 2009 study suggesting this could have repercussions for Russia's relations with the EU and NATO as a whole. Following the 2008 Russo-Georgian War, Finnish Prime Minister Matti Vanhanen reiterated that Finland had no plans to join NATO, and stated that the main lesson of the war was the need for closer ties to Russia. In a June 2014 interview in the Finnish newspaper Hufvudstadsbladet, Vladimir Putin's personal envoy Sergey Alexandrovich Markov accused Finland of extreme "Russophobia" and suggested that Finland joining NATO could start World War III. 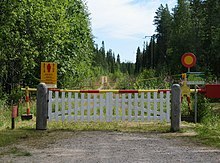 In July 2016, Putin stated on a visit to Finland, that Russia would increase the number of troops on the Finnish border if Finland were to join NATO. He also warned that NATO would "fight to the last Finn against Russia". A survey conducted by Finnish pollster EVA in January 2015 found that 43 percent of Finns polled opposed NATO membership, while 26 percent supported and 32 percent were undecided. EVA has noted a downward trend in the percent opposed that started in 1998, including a steep decline after the 2012 presidential election. In March 2014, during Russia's annexation of Crimea, one survey showed only 22 percent supported membership, though a second showed that 53 percent would support membership if Finnish leadership recommended it. Support for a military alliance with neighbor Sweden was also high, at 54 percent, and Finland could possibly seek an enlarged role for NORDEFCO. Finnish Minister of Defence Carl Haglund suggested that a referendum on NATO membership could be held sometime after the 2015 parliamentary election. The newest poll from October 2017 showed that support for membership remained at 22%, while rising to 33% in the suggested scenario in which Sweden would join. Ireland has been a member of NATO's Partnership for Peace (PfP) programme and Euro-Atlantic Partnership Council (EAPC) since 1999, but has not applied to join NATO as a member state due to its traditional policy of military neutrality. Ireland participates in the alliance's PfP Planning and Review Process (PARP), which aims to increase the interoperability of the Irish military, the Defence Forces, with other NATO member states and bring them into line with accepted international standards so as to successfully deploy with other professional military forces on peacekeeping operations overseas. Ireland supplied a small number of troops to the NATO-led International Security Assistance Force (ISAF) in Afghanistan (2001–2014) and supports the ongoing NATO-led Kosovo Force (KFOR). Currently no major political party in Ireland fully supports ascension into NATO, a reflection on public and media opinion in the country. There are a number of politicians who support Ireland joining NATO, mainly within the centre-right Fine Gael party, but the majority of politicians still do not. It is widely understood that a referendum would have to be held before any changes could be made to neutrality or to joining NATO. Former Secretary General of NATO Anders Fogh Rasmussen said during a visit to the country in 2013 that the "door is open" for Ireland to join NATO at any time. Moldova's constitution forbids the country from joining a military alliance, but some politicians, such as Moldovan Minister of Defence Vitalie Marinuța, have suggested joining NATO as part of a larger European integration. Moldova joined NATO's Partnership for Peace in 1994, and initiated an Individual Partnership Action Plan in 2010. Following the 2014 annexation of Crimea by Russia, NATO officials warned that Russia might seek to annex Transnistria, a breakaway Moldovan region. This separatist issue could preclude Moldova from joining NATO. The NATO intervention in Bosnia and Herzegovina in 1992 and the NATO bombing of Yugoslavia in 1999 resulted in strained relations between Serbia and NATO. Relations were further strained following Kosovo's declaration of independence in 2008 while a protectorate of the United Nations with security support from NATO. However, Serbia was invited and joined the Partnership for Peace programme during the 2006 Riga summit and in 2008, was invited to enter the intensified dialogue programme whenever the country is ready. Serbia's Parliament passed a resolution in 2007 which declared their military neutrality until such time as a referendum was held on the issue. On 1 October 2008, Serbian Defence Minister Dragan Šutanovac signed the Information Exchange Agreement with NATO, one of the prerequisites for fuller membership in the Partnership for Peace programme. In April 2011 Serbia's request for an IPAP was approved by NATO, and Serbia submitted a draft IPAP in May 2013. The agreement was finalized on 15 January 2015. A CeSID poll in June 2015 conducted with the support of the United States Agency for International Development (USAID) indicated that only 12 percent of those polled supported for NATO membership, down from 25 percent in 2012, and 73 percent were opposed. The minor Liberal Democratic Party and Serbian Renewal Movement remain the most vocal political parties in favor of NATO membership. Although Serbia aspires to join the European Union, Serbia may seek to maintain military neutrality, joining neither NATO nor the Collective Security Treaty Organization (CSTO). Sweden has close relations with NATO and NATO members, and participates in training exercises like the Admiral Pitka Recon Challenge in Estonia. In 1949 Sweden chose not to join NATO and declared a security policy aiming for non-alignment in peace and neutrality in war. A modified version now qualifies non-alignment in peace for possible neutrality in war. This position was maintained without much discussion during the Cold War. Since the 1990s however there has been an active debate in Sweden on the question of NATO membership in the post–Cold War world. These ideological divides were visible in November 2006 when Sweden could either buy two new transport planes or join NATO's plane pool, and in December 2006, when Sweden was invited to join the NATO Response Force. Sweden have been active participants in NATO-led missions in Bosnia (IFOR and SFOR), Kosovo (KFOR), Afghanistan (ISAF), and Libya (Operation Unified Protector). The ruling Swedish Social Democratic Party have remained in favour of neutrality and non-alignment. This preference is shared by their partners, the Green Party, as well as the Left Party. The centre-right Moderate Party and the Liberal Party are the largest parties by current parliamentary representation in favor of NATO membership. The 2014 Russian annexation of Crimea is credited with renewed public calls for NATO membership from notable politicians. The Centre Party was opposed to NATO membership until September 2015, when party leadership under Annie Lööf announced that they would motion to change the party policy in order to push for Sweden to join NATO at their next party conference. The Christian Democrats, also previously opposed, likewise voted to support NATO membership at their party meeting on 9 October 2015. Polling has shown a rise in support for NATO membership among Swedes since 2008 according to Ipsos polling, going from 22 percent in May 2008 to 33 percent in January 2015, with another from the SOM Institute in May 2015 showing similar numbers. According to Svenska Dagbladet, support in 2011 was at 23 percent, and has risen somewhat significantly to 41 percent in September 2015, when only 39 percent of respondents were opposed to NATO membership. An October 2014 survey commissioned by TV4 News also showed slightly more respondents supporting membership than opposing it. In 2014, news that a military expert in Sweden had calculated that the country could hold out for a week if attacked temporarily lifted support for NATO membership in polls. A May 2017 poll by Pew showed that support for membership had risen to 47 percent. A NATO radar facility in Malta. Like other non-NATO member European states, Malta has generally cooperative relations with the organization. Austria and Switzerland are both members of the Partnership for Peace, and border NATO member states. Malta is also a member of the Partnership for Peace and the European Union. However, each country has a long-standing policy of neutrality. Cyprus is the only member state of the European Union that is not a member of the Partnership for Peace, with any treaty blocked by Turkey's concerns regarding the Cyprus dispute. According to Minister of Foreign Affairs Enver Hoxhaj, integration with NATO is a priority for Kosovo, which declared independence from Serbia in 2008. Hoxhaj stated in 2014 that the country's goal is to be a NATO member by 2022. However, four NATO member states—Greece, Romania, Spain, and Slovakia—do not recognize Kosovo's independence. United Nations membership, which Kosovo does not have, is considered to be necessary for NATO membership. In December 2018, the Kosovar Prime Minister Ramush Haradinaj stated that Kosovo will apply for NATO membership after the formation of the Kosovo Armed Forces. Russia, Armenia, Belarus, and Kazakhstan are all members of the Collective Security Treaty Organization (CSTO), an alternative military alliance. In 2009, Russian envoy Dmitry Rogozin did not rule out joining NATO at some point, but stated that Russia was currently more interested in leading a coalition as a great power. Azerbaijan has committed to a policy of neutrality, but has not ruled out eventually joining NATO or the CSTO. Some individuals have proposed expanding NATO outside of Europe, although doing so would require amending Article 10 of the North Atlantic Treaty. Christopher Sands of the Hudson Institute proposed Mexican membership of NATO in order to enhance NATO cooperation with Mexico and develop a "North American pillar" for regional security. In June 2013, Colombian President Juan Manuel Santos stated his hope that Colombia's cooperation with NATO could result in NATO membership, though his Foreign Minister, Juan Carlos Pinzon, quickly clarified that Colombia is not actively seeking NATO membership. Ivo Daalder and James Goldgeier proposed a "global NATO" that would incorporate democratic states from around the world, including Australia, New Zealand, Japan, South Korea, Brazil, South Africa, and India, while Republican presidential candidate Rudy Giuliani suggested expanding NATO to include Singapore, Israel, Australia, India, and Japan. On March 20 2019, US President, Donald Trump said he would make Brazil a Major non-NATO ally at a meeting with Brazilian President, Jair Bolsonaro at the White House. During a joint press conference, President Trump expressed support for the eventual ascension of Brazil into NATO. France however has rejected the proposal claiming Article 10 of the treaty limits geography of membership to European countries. ^ Ghosh, Palash (26 June 2012). "Why Is Turkey In NATO?". The International Business Times. Retrieved 13 September 2014. ^ Haftendorn, Helga (Summer 2005). "Germany's accession to NATO: 50 years on". NATO Review. Retrieved 13 September 2014. ^ Magone 2009, p. 439. ^ Magone 2009, pp. 385–386. ^ Sarotte, Mary Elise (September – October 2014). "A Broken Promise?". Foreign Affairs. Retrieved 28 August 2014. ^ a b c d e f Kramer, Mark; Shifrinson, Joshua R. Itzkowitz (1 July 2017). "NATO Enlargement—Was There a Promise?". International Security. 42 (1): 186–192. doi:10.1162/isec_c_00287. ISSN 0162-2889. ^ a b c "Deal or No Deal? The End of the Cold War and the U.S. Offer to Limit NATO Expansion". doi:10.1162/ISEC_a_00236. ^ Kramer, Mark (1 April 2009). "The Myth of a No-NATO-Enlargement Pledge to Russia". The Washington Quarterly. 32 (2): 39–61. doi:10.1080/01636600902773248. ISSN 0163-660X. ^ "NATO Expansion: What Gorbachev Heard | National Security Archive". nsarchive.gwu.edu. Retrieved 12 December 2017. ^ "When Washington Assured Russia NATO Would Not Expand". ^ Pifer, Steven. "Did NATO Promise Not to Enlarge? Gorbachev Says "No"". Brookings. Retrieved 11 September 2017. ^ Zoellick, Robert B. (22 September 2000). "The Lessons of German Unification". The National Interest. ^ David & Levesque 1999, p. 200–201. ^ Gheciu 2005, p. 72. ^ Barany 2003, pp. 23–25. ^ Barany 2003, pp. 16–18. ^ Epstein, Rachel (2006). "Nato Enlargement and the Spread of Democracy: Evidence and Expectations". Security Studies. 14: 63–105. doi:10.1080/09636410591002509. ^ Barany 2003, pp. 190, 48–50. ^ Perlez, Jane (17 November 1997). "Hungarians Approve NATO Membership". The New York Times. Retrieved 4 December 2014. ^ Murphy, Dean E. (14 January 1995). "Chechnya Summons Uneasy Memories in Former East Bloc". The Los Angeles Times. ISSN 0458-3035. Retrieved 22 November 2015. ^ Wolchik & Curry 2011, p. 148. ^ a b Peter, Laurence (2 September 2014). "Why Nato-Russia relations soured before Ukraine". BBC News. Retrieved 1 October 2014. ^ Umland, Andreas (2016). "Intermarium: The Case for Security Pact of the Countries between the Baltic and Black Seas". IndraStra Global. 2 (4): 2. ^ "No Smoking Law, Alcohol Limit-Yes, Referendum-No". Dalje. 4 January 2008. Archived from the original on 9 January 2015. Retrieved 9 January 2015. ^ Bilefsky, Dan (22 March 2009). "Slovenia Border Spat Imperils Croatia's NATO Bid". The New York Times. Retrieved 9 January 2015. ^ "Slovenia Ratifies Croatia's Accession in NATO". Dalje. 9 February 2008. Archived from the original on 9 January 2015. Retrieved 9 January 2015. ^ "Albania, Croatia become NATO members". NBC News. Associated Press. 1 April 2009. Retrieved 9 January 2015. ^ "Montenegro Hands over Application for NATO's MAP". Turkish Weekly. MIA. 6 November 2008. Archived from the original on 9 February 2015. Retrieved 9 February 2015. ^ "Montenegro Joins NATO Membership Action Plan". 4 December 2009. Retrieved 4 December 2009. ^ "Development of relations between Montenegro and NATO – key dates". Ministry of Foreign Affairs and European Integration. 2013. Retrieved 5 June 2015. ^ "NATO's relations with Montenegro". NATO. 19 November 2014. Retrieved 9 February 2015. ^ Emmott, Robin; Siebold, Sabine (2 December 2015). "NATO invites Montenegro to join alliance, defying Russia". Reuters. Retrieved 2 December 2015. ^ Dahlburg, John-Thor; Lee, Matthew (19 May 2016). "NATO formally invites Montenegro as 29th member". Associated Press. Archived from the original on 21 May 2016. Retrieved 19 May 2016. ^ "Montenegro becomes NATO's 29th member amid bitter opposition from Moscow". The Japan Times. AFP-JIJI. 5 June 2017. Retrieved 5 June 2017. ^ North Atlantic Treaty . 1949 – via Wikisource. ^ "Fogh in the Aegean". The Economist. 10 September 2009. Retrieved 11 December 2011. ^ Frappi & Carati 2009, p. 50. ^ Marshall, Andrew (8 February 1995). "Transatlantic rift haunts Nato". Retrieved 30 December 2014. ^ Trifunovska 1996, pp. 16–17. ^ Pifer, Steven (2 July 2014). "Putin's NATO Fears Are Groundless". The Moscow Times. Retrieved 29 December 2014. ^ "Membership Action Plan (MAP)". NATO (Press release). 24 April 1999. NAC-S(99)66. Retrieved 5 February 2015. ^ a b "NATO enlargement". NATO Topics. 12 June 2014. Archived from the original on 6 February 2015. Retrieved 29 December 2014. ^ Bigg, Claire (2 April 2008). "NATO: What Is A Membership Action Plan?". Radio Free Europe/Radio Liberty. Retrieved 6 February 2015. ^ a b "Membership Action Plan (MAP)". NATO. 10 June 2014. Archived from the original on 18 April 2015. Retrieved 9 February 2015. ^ "The Road to NATO membership". NATO. 21 September 2007. Retrieved 14 September 2008. ^ a b "NATO launches 'Intensified Dialogue' with Ukraine". NATO. 20 April 2005. ^ "NATO offers Intensified Dialogue to Georgia". NATO. 21 September 2006. ^ Giragosian, Richard (31 July 2006). "Georgia: Kodori Operation Raises NATO Questions". Radio Free Europe/Radio Liberty. Retrieved 5 February 2015. ^ Vucheva, Elitsa (4 April 2008). "France signals full return to NATO". EUobserver. Retrieved 6 February 2015. ^ a b "NATO offers "intensified dialogue" to Serbia". B92. 3 April 2008. Retrieved 20 September 2008. ^ "Russia says Georgia's entry to NATO could lead to war". The Atlantic Council. RIA Novosti. 9 December 2011. Retrieved 30 December 2014. ^ a b "Enlargement". NATO. 9 March 2018. Retrieved 10 March 2018. ^ "Signatures of Partnership for Peace Framework Document". NATO. 10 January 2012. Retrieved 9 February 2015. ^ "Individual Partnership Action Plans". NATO. Retrieved 13 November 2013. ^ "NATO Allies sign Accession Protocol for the future Republic of North Macedonia". NATO. 6 February 2019. Retrieved 6 February 2019. ^ a b "NATO's relations with Bosnia and Herzegovina". NATO. 17 June 2014. Retrieved 5 June 2015. ^ a b c "Nato Macedonia veto stokes tension". BBC News. 4 April 2008. Retrieved 5 February 2015. ^ "NATO Approves Membership Action Plan for Bosnia". balkaninsight.com. ^ a b "Bosnia gets Nato membership plan". BBC News. 22 April 2010. Retrieved 22 April 2010. ^ "NATO Grants 'Intensified Dialogue' to Georgia". Civil Georgia. 21 September 2006. Retrieved 15 September 2008. ^ a b "NATO-Ukraine Action Plan". NATO. 22 November 2002. Retrieved 11 November 2013. ^ "NATO launches 'Intensified Dialogue' with Ukraine". NATO Update. 21 April 2005. Retrieved 21 April 2005. ^ "Bosnia, NATO sign security deal". B92. 19 March 2007. Retrieved 22 September 2008. ^ "Adriatic Charter Fact Sheet". Bureau of European and Eurasian Affairs. U.S. Department of State. 25 August 2011. Archived from the original on 13 July 2015. Retrieved 5 June 2015. ^ Sarić, Lejla (23 April 2010). "BiH dobila zeleno svjetlo za MAP" (in Bosnian). Retrieved 6 February 2015. ^ "Bosnia and Herzegovina and Membership Action Plan". NATO. 22 April 2010. Retrieved 17 November 2013. ^ "NATO rules out admitting new members anytime soon". Fox News. Associated Press. 5 July 2014. Retrieved 6 February 2015. ^ Pop, Valentina (23 April 2010). "Nato grants Bosnia pre-membership status". EUobserver. Retrieved 6 February 2015. ^ Law on Defence of Bosnia and Herzegovina (PDF). ^ Kovacevic, Danijel (16 August 2017). "Court Rejects Bosnian Serb Claim to Army Facilities". Retrieved 18 August 2017. ^ Lakic, Mladen (5 December 2018). "NATO Approves Membership Action Plan for Bosnia". Balkan Insight. Retrieved 5 December 2018. ^ "Public Opinion Poll Bosnia and Herzegovina" (PDF). National Democratic Institute. August 2010. p. 35. Retrieved 25 June 2014. ^ a b "Bosnia's NATO hopes 'depend on Serbia'". The Journal of Turkish Weekly. 27 March 2014. Archived from the original on 28 March 2014. Retrieved 28 March 2014. ^ "Bosnian Serbs pass resolution against NATO membership". The Washington Post. Associated Press. 18 October 2017. Retrieved 18 October 2017. ^ a b "Russia says Georgia war stopped NATO expansion". Reuters. 21 November 2011. ^ "Georgians back NATO membership in referendum". Sputnik International. RIA Novosti. 11 January 2008. Retrieved 7 April 2015. ^ Kucera, Joshua (2 May 2013). "Ivanishvili: We Will Get NATO MAP in 2014". Retrieved 17 August 2013. ^ Croft, Adrian (20 June 2014). "NATO unlikely to grant Georgia step to membership: diplomats". Reuters. Retrieved 20 June 2014. ^ Croft, Adrian (25 June 2014). "NATO will not offer Georgia membership step, avoiding Russia clash". Reuters. Retrieved 25 June 2014. ^ Miko, Jason (3 September 2010). "MIKO: A place at the table for Macedonia". The Washington Times. Retrieved 22 July 2015. ^ "NATO's relations with the former Yugoslav Republic of Macedonia". NATO. 26 May 2008. Archived from the original on 17 April 2009. Retrieved 22 September 2008. ^ Lungescu, Oana (2 April 2008). "Nato Macedonia veto stokes tension". BBC News. Retrieved 12 May 2008. ^ "ICJ rules Greece 'wrong' to block Macedonia's Nato bid". BBC News. 5 December 2011. Retrieved 19 February 2012. ^ Thiele 2005, pp. 73–74. ^ Novak, Marja; Williams, Alison (10 March 2016). "Macedonia hopes migrant crisis will bring it closer to NATO". Reuters. Retrieved 11 March 2016. ^ "Macedonians Won't Give Up Name for NATO". Angus Reid Global Monitor. 13 March 2008. Archived from the original on 5 December 2008. Retrieved 20 September 2008. ^ "PM claims win in Macedonian poll". BBC News. 2 June 2008. Retrieved 20 September 2008. ^ Sandford, Alasdair (11 May 2015). "NATO calls for investigation into Kumanovo violence in FYR Macedonia". Euronews. Reuters. Retrieved 22 July 2015. ^ "Macedonian President Urges EU and NATO to Make Brave Decisions on the Balkans". Independent.mk. 8 June 2015. Archived from the original on 23 July 2015. Retrieved 22 July 2015. ^ "81 percent of Macedonians support NATO and 68 percent – EU membership". Republika Online. 18 November 2014. Retrieved 6 February 2015. ^ Smith, Helena (13 June 2017). "Macedonia and Greece appear close to settling 27-year dispute over name". The Guardian. ISSN 0261-3077. Retrieved 14 June 2017. ^ "NATO invites Macedonia to begin membership talks, says it can join once name issue is resolved". ABC News. 11 July 2019. Retrieved 11 July 2018. ^ "Formal Accession Talks with Skopje begin at NATO Headquarters". NATO. 8 October 2018. Retrieved 8 October 2018. ^ "NATO's relations with Ukraine". NATO. 16 December 2014. Retrieved 9 February 2015. ^ Yekelchyk 2007, p. 202. ^ Ďurianová, Marta (20 March 2006). "President Gašparovič meets Ukrainian Foreign Affairs Minister". The Slovak Spectator. Retrieved 20 September 2008. ^ Ambrosio 2013, pp. 150–154. ^ Erlanger, Steven (5 April 2008). "Putin, at NATO Meeting, Curbs Combative Rhetoric". The New York Times. Retrieved 27 March 2014. 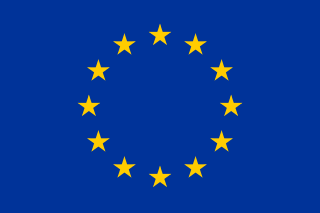 ^ "Ukraine's Yanukovych: EU ties a 'key priority'". Kyiv Post. Associated Press. 1 March 2010. Retrieved 7 April 2015. ^ "Ukraine vows new page in ties with Russia". The News International. 6 March 2010. Retrieved 9 March 2010. ^ Croft, Adrian; Mason, Jeff (26 March 2014). "Obama says NATO needs to boost presence in eastern Europe". Reuters. Retrieved 27 March 2014. ^ "Putin admits Russian forces were deployed to Crimea", Reuters, 17 April 2014, We had to take unavoidable steps so that events did not develop as they are currently developing in southeast Ukraine. ... Of course our troops stood behind Crimea's self-defence forces. ^ "Ukraine to seek Nato membership, says PM Yatsenyuk". BBC News. 9 August 2014. Retrieved 9 February 2015. ^ "Ukraine votes to drop non-aligned status". BBC News. 23 December 2014. Retrieved 23 December 2014. ^ "Door to NATO remains open for Ukraine". Euronews. 26 February 2014. Retrieved 27 February 2014. ^ "Support for joining NATO considerably increases in Ukraine –poll". Interfax-Ukraine. 3 August 2015. Retrieved 4 August 2015. ^ Williams, Carol J. (14 May 2014). "Russian aggression driving Ukrainians toward EU, NATO, poll finds". The Los Angeles Times. Retrieved 15 May 2014. ^ "Rada restores Ukraine's course for NATO membership as foreign policy priority". Interfax-Ukraine. 8 June 2017. Retrieved 8 June 2017. ^ "Pledging reforms by 2020, Ukraine seeks route into NATO". Reuters. 10 July 2017. Retrieved 22 July 2017. ^ "Ukraine pushes ahead with plans to secure NATO membership". Associated Press. 20 September 2018. Retrieved 15 October 2018. ^ Grenfell & Jopling 2008, p. 13. ^ "Finland To Sign Memorandum Of Understanding With NATO". Finnbay. 22 April 2014. Retrieved 22 April 2014. ^ "Kokoomus päätti Nato-linjastaan: Puolustusliittoon lähivuosina". Verkkouutiset. 12 June 2016. Retrieved 12 June 2016. ^ "RKP on nyt virallisesti Nato-puolue". Yle. 12 June 2016. Retrieved 12 June 2016. ^ Rosendahl, Jussi; Suoninen, Sakari (14 June 2014). "Stubb to be Finland's next PM, backs NATO membership". Reuters. Retrieved 14 June 2014. ^ "Ex-President Ahtisaari calls on Finland to join NATO with Sweden". Alaska Dispatch. YLE News. 12 April 2014. Archived from the original on 19 April 2014. Retrieved 18 April 2014. ^ "Russian Foreign Minister Lavrov: Finland Wouldn't Dare for NATO Membership". Finnbay. 15 June 2014. Retrieved 15 June 2014. ^ "Waking the Neighbour: Finland, NATO and Russia: Keir Giles and Susanna Eskola, UK Defence Academy, November 2009" (PDF). ^ Nilsen, Thomas (9 June 2014). "Putin envoy warns Finland against joining NATO". Barents Observer. Retrieved 9 June 2014. ^ "Putin moitti Natoa tiukasti Suomen-vierailullaan". Helsingin Sanomat. 2 July 2016. Retrieved 3 July 2016. ^ Putin has toughened up his rhetoric, views expert. helsinkitimes.fi (5 July 2016). Retrieved on 22 July 2016. ^ "MEVAn Arvo- ja asennetutkimuksen ennakkotieto: Nato-kannat muuttuneet myönteisemmiksi". Elinkeinoelämän valtuuskunta (in Finnish). 3 February 2015. Retrieved 11 February 2015. ^ "Most Fins reject NATO membership despite Ukraine crisis". Global Times. Xinhua. 24 March 2014. Retrieved 27 March 2014. ^ Schauman, Satu (25 March 2014). "Verkkouutiset selvitti: Kansa valmis Natoon, jos valtiojohto niin haluaa". Verkkouutiset (in Finnish). Retrieved 1 September 2014. ^ O'Dwyer, Gerard (26 March 2014). "Majority of Finns Support Swedish Military Alliance". Defense News. Retrieved 27 March 2014. ^ Steffen, Sarah (26 March 2014). "NATO next for Sweden and Finland?". DeutscheWelle. ^ Suoninen, Sakari; Rosendahl, Jussi (18 June 2014). "Finnish reasons for joining NATO 'stronger than ever': defense minister". Reuters. Retrieved 18 June 2014. ^ "HS-gallup: Suomalaiset tyrmäävät Nato-jäsenyyden – mutta onko Suomi jo tiiviimmin Naton kyljessä kuin kansa tajuaakaan?". Helsingin Sanomat. 5 November 2017. Retrieved 5 November 2017. ^ Wade, Jennifer (21 March 2013). "Ireland committed to Partnership for Peace but has no plans to join NATO – Shatter". The Journal. Retrieved 20 February 2016. ^ "Current Missions > ISAF". Defence Forces Ireland. Archived from the original on 16 July 2015. Retrieved 15 July 2015. ^ a b Sanchez, W. Alex (9 January 2013). "Moldova and NATO: Expansion Stops at the Dniester River?". E-International Relations. Retrieved 28 March 2014. ^ Morello, Carol (23 March 2014). "NATO general warns of further Russian aggression". Washington Post. Retrieved 28 March 2014. ^ "Serbian parliament's Kosovo resolution". B92. 27 December 2007. Retrieved 17 December 2013. ^ "Šutanovac, NATO sign agreement". b92. 1 October 2008. Retrieved 5 June 2015. ^ "NATO's relations with Serbia". NATO. 16 January 2015. Archived from the original on 12 November 2013. Retrieved 9 February 2015. ^ "Serbia and NATO, are we at a turning point?". Ministry of Foreign Affairs of Serbia. 25 July 2013. Retrieved 11 November 2013. ^ "Dacic: IPAP, step forward in Serbia-NATO relations". infoBalkans. Tanjug. 16 January 2015. Retrieved 16 January 2015. ^ "Serbia: Only 50 pct of citizens support EU integration, 73 pct against NATO membership". InSerbia. Tanjug. 30 June 2015. Retrieved 23 July 2015. ^ Radoman, Jelena (10 December 2010). "NATO-Serbia relations: New strategies or more of the same?". EurActiv. Retrieved 25 June 2014. ^ "Swiss envoy: Serbia doesn't need to join NATO". UPI. 26 November 2013. Retrieved 28 March 2014. ^ Agius 2006, p. 103–105. ^ Agius 2006, p. 142–147. ^ "Sweden: one of NATO's most active and effective partners". NATO. 14 January 2013. Retrieved 9 February 2015. ^ "What price neutrality?". The Economist. 21 June 2014. Retrieved 5 May 2015. ^ Simpson, Peter Vinthagen; Parafianowicz, Lydia (13 May 2009). "Liberals: Sweden must join NATO". The Local. Retrieved 9 February 2015. ^ Ford, Matt (12 March 2014). "After Crimea, Sweden Flirts With Joining NATO". The Atlantic. Retrieved 28 March 2014. ^ Rolander, Niclas (6 March 2014). "Sweden Mulls "Doctrine Shift" in Defense After Russian Incursion in Ukraine". The Wall Street Journal. Retrieved 27 March 2014. ^ Ahlander, Johan (9 October 2015). "Swedish centre right in favour of NATO membership". Reuters. Retrieved 10 October 2015. ^ a b "Swedish support for joining Nato swells". The Local. 29 October 2014. Retrieved 30 October 2014. ^ "More Swedes show support for Nato". The Local. 9 January 2015. Retrieved 1 September 2015. ^ "Nearly one-third of Swedes want to join Nato". The Local. 20 May 2015. Retrieved 1 September 2015. ^ "More Swedes in favour of joining Nato: poll". The Local. 16 May 2013. Retrieved 27 March 2014. ^ "More Swedes want to join Nato than stay out". The Local. 15 September 2015. Retrieved 14 September 2015. ^ Turtiainen, Suvi (9 April 2014). "Sweden and Finland Face Their Russian Fears". Real Clear World. Retrieved 22 April 2014. ^ Stokes, Bruce (23 May 2017). "NATO's Image Improves on Both Sides of Atlantic". Pew Research Center's Global Attitudes Project. Retrieved 28 May 2017. ^ Smith 2006, pp. 446–448. ^ Fsadni, Ranier (25 April 2013). "The meaning of neutrality". Times of Malta. Retrieved 28 March 2014. ^ Dempsey, Judy (24 November 2010). "Between the European Union and NATO, Many Walls". New York Times. Retrieved 28 March 2014. ^ "Hoxhaj: Pas anëtarit vëzhgues në Asamblenë Parlamentare të NATO-s, Kosova edhe me ushtri" (in Albanian). Ministry of Foreign Affairs of Kosovo. 24 June 2014. Retrieved 27 July 2015. ^ "Hoxhaj në Mitrovicë, Kosova anëtarësohet në NATO para 2022". Ministry of Foreign Affairs of Kosovo. 16 May 2014. Retrieved 16 May 2014. ^ "Kosovo question still divides EU". Deutsche Welle. 8 September 2012. Retrieved 5 June 2015. ^ "Daily: No NATO membership for Kosovo". 5 February 2013. Retrieved 11 November 2013. ^ "Kosovo PM: "After approving army, Kosovo will apply for NATO"". top-channel.tv. Retrieved 8 December 2018. ^ "Azerbaijan not to join any military coalition including NATO". Xinhua. 23 May 2012. Retrieved 28 March 2014. ^ "Azerbaijan not to join NATO". Zee News. 25 May 2013. Retrieved 28 March 2014. ^ a b Daalder, Ivo; James Goldgeier (October 2006). "Global NATO". Foreign Affairs. Retrieved 28 March 2014. ^ Sands, Christopher (18 May 2012). "Why NATO Should Accept Mexico". Huffington Post. Retrieved 28 March 2014. ^ Woodroofe, Thom (12 May 2012). "NATO: the Australian experience". ABC. Retrieved 28 March 2014. ^ Samuels, Brett (19 March 2019). "Trump suggests admitting Brazil to NATO alliance". The Hill. Retrieved 25 March 2019. ^ McGuinness, Romina (21 March 2019). "France rejects Trump demand to give Brazil NATO membership". Express. Retrieved 25 March 2019. Ambrosio, Thomas (2013). Authoritarian Backlash: Russian Resistance to Democratization in the Former Soviet Union. Ashgate Publishing, Ltd. ISBN 978-1-4094-9889-6. Agius, Christine (2006). The social construction of Swedish neutrality: Challenges to Swedish identity and sovereignty. Manchester University Press. ISBN 978-1-84779-199-3. Barany, Zoltan (2003). The Future of NATO Expansion: Four Case Studies. Cambridge University Press. ISBN 978-1-139-44044-8. David, Charles-Philippe; Levesque, Jacques (1999). Future of NATO: Enlargement, Russia, and European Security. McGill-Queen's Press. ISBN 978-0-7735-6785-6. Frappi, Carlo; Carati, Andrea (2009). NATO in the 60th anniversary of the North Atlantic Treaty. FrancoAngeli. ISBN 978-88-568-1977-9. Gheciu, Alexandra (2005). NATO in the New Europe: The Politics of International Socialization After the Cold War. Stanford University Press. ISBN 978-0-8047-6766-8. Grenfell, Julian; Jopling, Thomas Michael (2008). FRONTEX: the EU external borders agency, 9th report of session 2007–08. House of Lords Stationery Office. ISBN 978-0-10-401232-1. Magone, José María (2009). Contemporary Spanish Politics. Taylor & Francis. ISBN 978-0-415-42188-1. Smith, Simon C. (2006). Malta: British documents on the end of empire. University of London Institute of Commonwealth Studies. ISBN 978-0-11-290590-5. Thiele, Ralph (2005). Mediterranean Security After EU and NATO Enlargement. Rubbettino Editore. ISBN 978-88-498-1037-0. Trifunovska, Snežana (1996). The Transatlantic Alliance on the Eve of the New Millennium. Martinus Nijhoff Publishers. ISBN 978-90-411-0243-0. Trifunovska, Snežana (2010). North Atlantic Treaty Organization. Kluwer Law International. ISBN 978-90-411-3328-1. Wolchik, Sharon L.; Curry, Jane Leftwich (2011). Central and East European Politics: From Communism to Democracy. Rowman & Littlefield. ISBN 978-0-7425-6734-4. Yekelchyk, Serhy (2007). Ukraine: Birth of a Modern Nation. Oxford University Press. ISBN 978-0-19-530546-3. The accession of Bosnia and Herzegovina to the European Union is the stated aim of the present relations between the two entities. Bosnia and Herzegovina has been recognised by the EU as a "potential candidate country" for accession since the decision of the European Council in Thessaloniki in 2003 and is on the current agenda for future enlargement of the EU. Bosnia and Herzegovina takes part in the Stabilisation and Association Process, and the relative bilateral SAA agreement has been signed in 2008, ratified in 2010, and entered into force in 2015. Meanwhile, the trade bilateral relations are regulated by an Interim Agreement. Bosnia formally applied for EU membership in February 2016, and it remains a potential candidate country until it gets a response from the Council. The Berlin Process is a diplomatic initiative linked to the future enlargement of the European Union. It started with the 2014 Conference of Western Balkan States, Berlin, followed by the 2015 Vienna Summit, 2016 Paris Summit and the 2017 Trieste Summit. The last conference was held in July 2018 in London. The Berlin Process was initiated in order to consolidate and keep the dynamics in EU integration process in the light of increased euroscepticism and 5-year stoppage of expansion announced by Commission President Jean Claude Juncker.